The field has done an extensive job looking at how body fat correlates to fertility and, just as importantly, how losing weight improves a person’s fertility. Before we delve into the data we probably need to get centered on how body fat is measured in most studies. 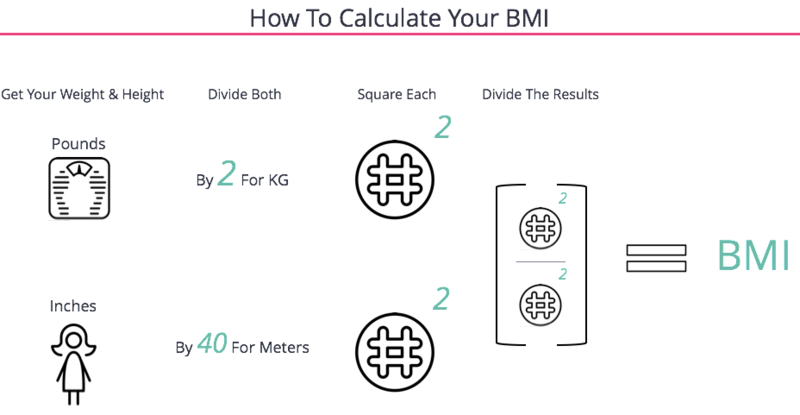 We’ll constantly refer back to Body Mass Index (BMI), which is a function of a person’s weight (in kilograms) divided by their height (in meters squared). While BMI has its imperfections (like the inability to distinguish between fat and muscle) it’s often an excellent proxy for body fat in most people and, unlike just using weight, takes into account a person’s height. 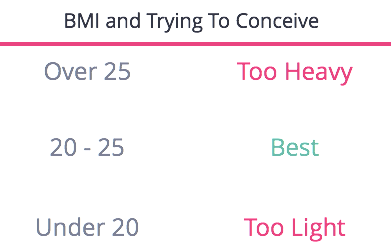 Generally speaking a “normal” female BMI is 18 - 25 but because being too light can impact a person’s ability to conceive, the ideal range for hopeful parents is 20 - 25. Generally speaking, being overweight or underweight can impact the quality of a woman’s eggs and potentially the quality of her uterine lining and the ability to carry a pregnancy. 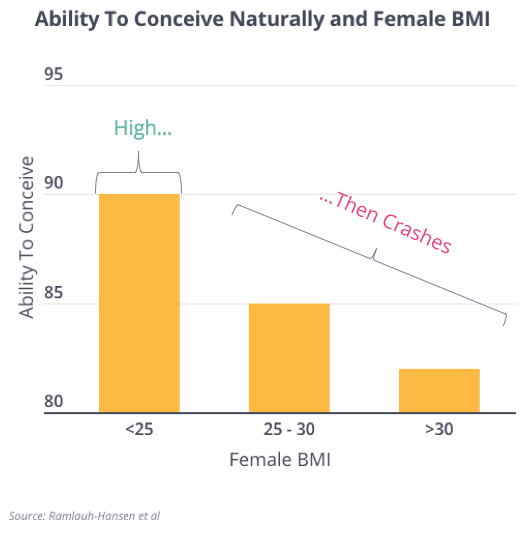 In this large Dutch study below, you’ll notice that as BMIs climb above 25, the odds a woman will be unable to conceive also rise in a pretty steady fashion. What we like about this study is investigators corrected for the male partner’s BMI because often women with high BMIs are coupled with men who have high BMIs and, as you’ll see, that factor independently raises the risk of infertility. Men who have an abnormally high or low BMI encounter bigger challenges. 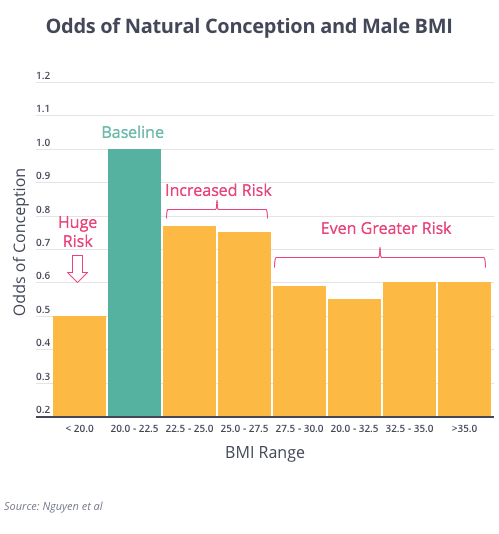 Below is data on over 20,000 Norwegian men that pitted their BMI against their relative likelihood of being unable to conceive. The analysis compares everyone against those with a normal BMI (in this case 20 - 22.5), smartly corrects for factors like the female partner’s BMI, and reminds us that not only is being too heavy a problem but so too is being too light. When a couple must resort to IVF, there is clearly a tight inverse correlation between a woman’s rising BMI levels and diminishing odds that any given IVF cycle will work. While this is most pronounced in women with PCOS, it’s also true for women who have no fertility issue (who are just doing treatment for male factor infertility), and the IVF population at large. 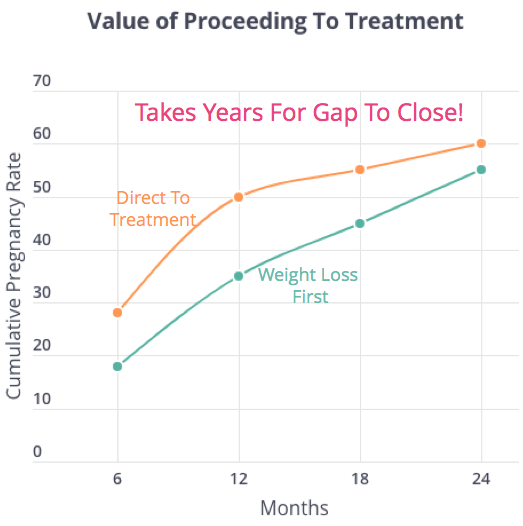 This brings up maybe the single biggest question in this course: is it better to proceed directly to fertility treatment or to hit pause and try to lose weight. Thankfully, we have a few good studies on the subject. The answer largely depends on the patient. In Dutch women with a BMI of 30 or higher, those put on a weight-loss program (restricted caloric intake and exercise) for six months before proceeding to fertility treatment (not just IVF) delivered fewer babies after two years than those who went right into treatment. This was true despite the fact the women in the weight-loss group actually succeeding in losing a fair amount of weight (most dropped three BMI points). 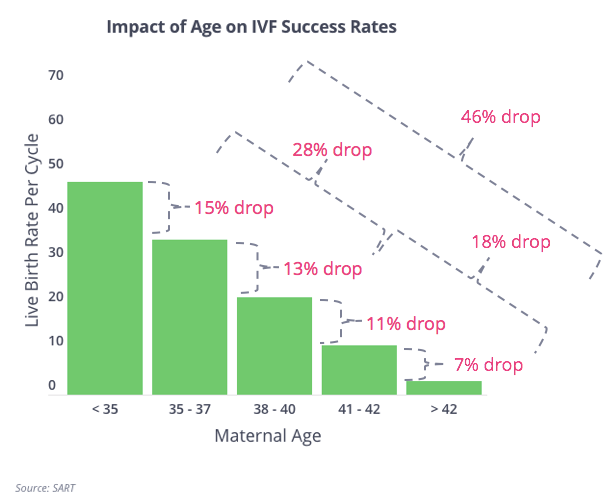 The penalty of waiting to lose weight could be even more severe in women over the age of 35 because, as you can see below, delays of even a year or two could dramatically swing the odds any given IVF cycle will work. We’d also like to raise two critical possible exceptions to what you read above. First, the method of weight loss may be important because while there is evidence that tactics like intense “calorie restriction” are not helpful, exercise in patients with high BMI, even if it does not result in weight loss, has been shown to be productive. 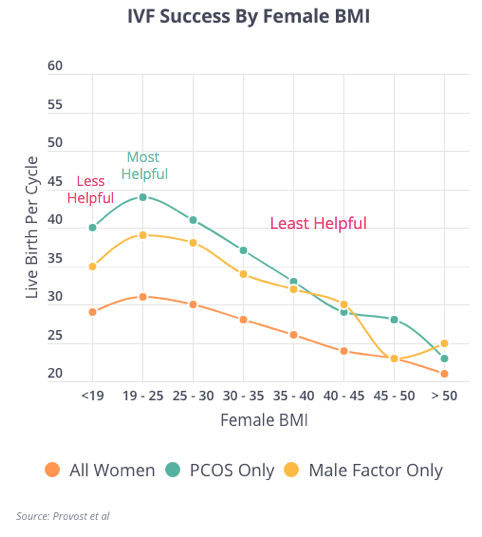 Second, women with PCOS likely do meaningfully benefit from weight reduction and in this case delaying treatment in favor of making lifestyle improvements may be warranted. 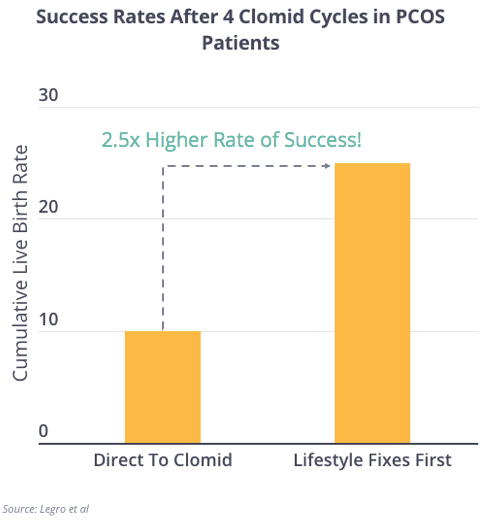 In a similar format to the Dutch weight loss study above, women with PCOS produced the opposite results: they dramatically benefited from undergoing a period of lifestyle improvement or weight loss before starting fertility treatment (in this case, Clomid). Once pregnant, women with a higher BMI typically encounter more complications during their pregnancies. 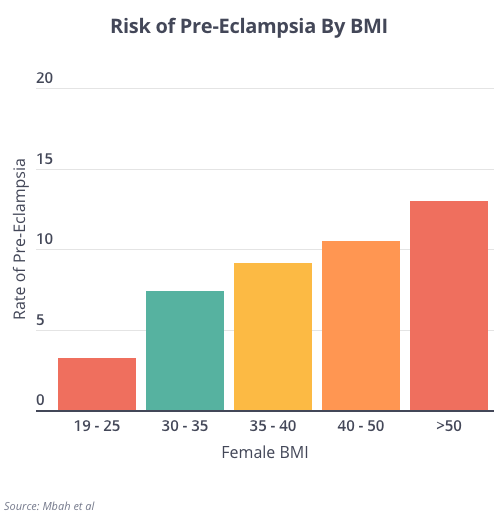 Pre-eclampsia is one example and the risks of developing preeclampsia (which correlate with delivery complications) rise significantly with a woman’s BMI. Finally, it appears clear that women with a higher (in this case, 30 or above) BMI deliver children far more likely to develop maladies like diabetes and hypertension. However, because of epigenetics, there is excellent reason to believe that if a woman modifies her lifestyle during pregnancy, this can alter the nature of the genetics she passes on to her children and grandchildren and change the odds future generation suffer from weight issues, diabetes and other maladies.